Terrier’s look to reverse their recent struggles as they begin a home-and-home with Providence tonight, traveling to Schneider Arena for a 7 p.m. start. The teams are tied for third place in Hockey East. 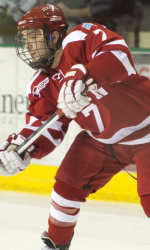 Terriers won the first BU-PC match-up, 4-2, which was the season opener, when current BU top scorer Cason Hohmann (photo) scored the game-winner and added two assists. Sean Maguire will be back in the net tonight. Patrick MacGregor returns to the blueline rotation with Garrett Noonan sitting out due to a suspension. Kevin Shattenkirk picked up his fifth assist of the young season in St. Louis' 3-2 loss to Chicago. Colby Cohen has been assigned to the ECHL South Carolina Stingrays, joining former BU assistant captain Justin Courtnall there. #5 Terriers are in Vermont for a game with the Catamount this afternoon, a 2 p.m. start with a free TV Webcast. BU is 8-0-2 in its last ten games. Freshman Sarah Lefort, who has a 13-13-26 line, was named Hockey East Rookie of the Week for the week of Jan. 14.